I wasn’t always a fan of indoor cycling classes. A decade ago, I took one less-than-stellar class at a gym that shall remain nameless and promptly vowed to never take one again. But then I was persuaded to try Soul Cycle. To my amazement, I loved it, and—like celebs Kelly Ripa, Kyra Sedgwick, and Katie Holmes—I quickly became hooked. 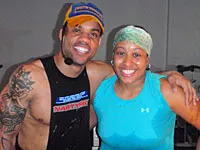 To explain why, allow me to take you through a Saturday morning class at the Tribeca Soul Cycle studio with one of my fave instructors, String. Picture a windowless, candlelit, hot box of a studio. I settle into my seat, which is always in the front row. There’s just something about the front row that makes me work harder, probably because there's nowhere to hide! I place my hands lightly on the handlebars, close my eyes, and begin pushing and pulling the pedals round and round. String turns down the lights, turns up the music, and we're off. He conducts his class like an orchestra, controlling the pace and tempo of the ride. He takes us through a series of sprints, climbs, core work, and even a quick on-bike arm-sculpting session with light weights, all set to his chosen soundtrack of the day. (Today it's a mix of everything from Katy Perry and Ke$ha to Nicki Minaj and Natasha Bedingfield.) The result: a super-intense, total body-toning workout—with a super-cool twist. Because if I didn’t know any better, I’d think this killer cardio-crushing class was set in the middle of Manhattan’s hippest nightclub. I mean, riders (including me!) are singing along to the music and literally dancing on the bikes! But don’t let the party-like atmosphere fool you. When you step into a Soul Cycle class, you are expected to work, and everyone knows it. The energy in the room is so strong that we all feed off it, using it to push each other through the tough moments (and believe me, there are a lot of them) even as we throw "Are you freakin' crazy?" looks at String as he barks commands to go faster, push harder. As the last song fades and each of us crosses our own personal finish line, I feel a little sad that class is over. Soul Cycle has become a pseudo-therapy session for me. I sweat through my problems. I sweat through all the negativity in my life. I sweat through my T-shirt, too! Then I emerge, feeling incredibly energized. Like the name suggests, it's food for my soul. Currently, you'll find Soul Cycle studios only in New York City and Miami, but more studios and cities are in the works. If you have the chance to take a class, grab it. Just beware: It's addictive. Will Easing Bike Helmet Laws Up Ridership?